In the App store for Project Online and Project Server 2013, a lot of useful solutions are already available for easy deployment. Many of them are free, and absolutely worth deploying, as they can help improve usability and system administration. Every month new Apps are added to the store, and as a service to my blog followers I will blog about those I find most interesting. My first review is of a simple yet very useful App, which I am sure will make every manager/PMO lead smile. 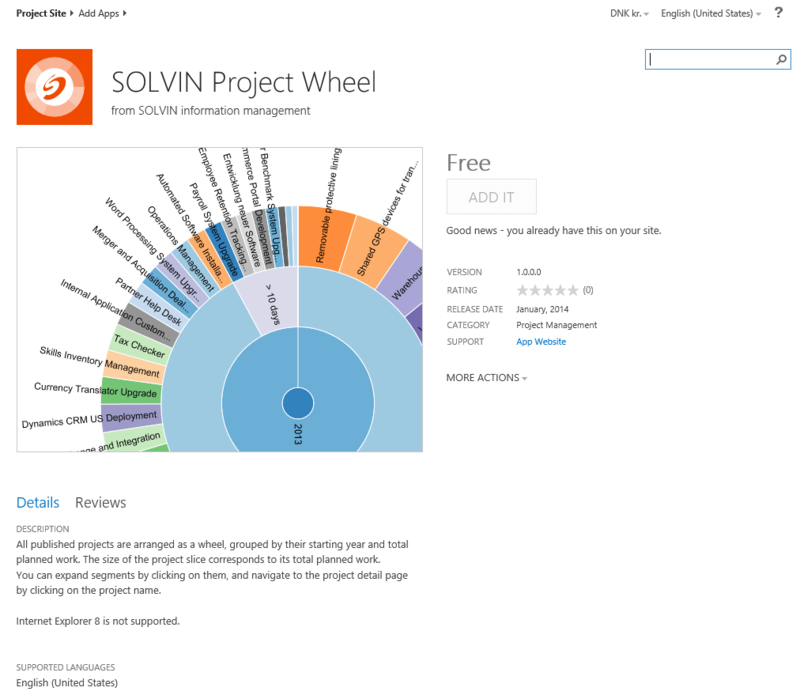 The App is called “Project Wheel” and is made by the company German PPM partner SOLVIN. What it does is simply to load all available projects and place them in wheel, by which you can filter/group by year and total planned work . By clicking in the middle zones, the wheel automatically filters to the corresponding projects. It´s worth noticing that the actual filtering is very impressive due to smooth graphical animations, that every manager would simply love watching. Finally, by clicking on the projects found, one can navigate directly to the Project Detail Pages for more information. The app is free and very simple to use and deploy. Previous Post: Project Server 2013 SP1 is out now! Can I install this App inside Project Online? I tried to follow the instructions in below link, but in vain! Thank you for the feedback. Sure you can install the app inside Project Online. You just navigate to the “add app” settings of your Project Online environment. From here you change the search language (top right corner) to US-English and find the Project Wheel under Project Management. From here, simply click “add app” and follow the instructions. Once its done deploying you can find it under “Site Contents” and perhaps add a hyperlink directly to app from your “Quick Launch” bar. I tried to find search language, Its not available! and also my default language is English! We didn’t find a match here, but check out the SharePoint Store. We didn’t find a match here, but search across all your apps. Did you choose the SharePoint Store before you did a search. E.g. navigate to add an app, select “SharePoint Store” in the left side pane and then see all the available apps.